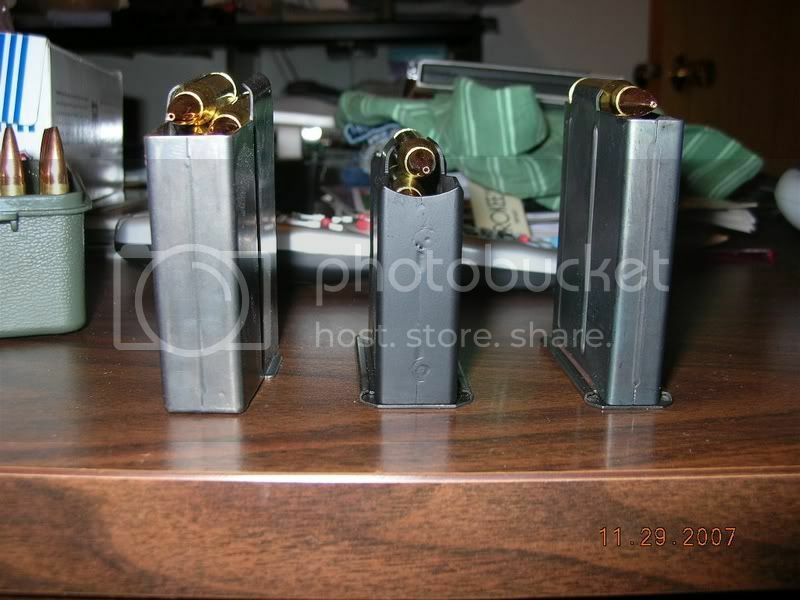 In each of the following mags there are 3 rounds loaded. 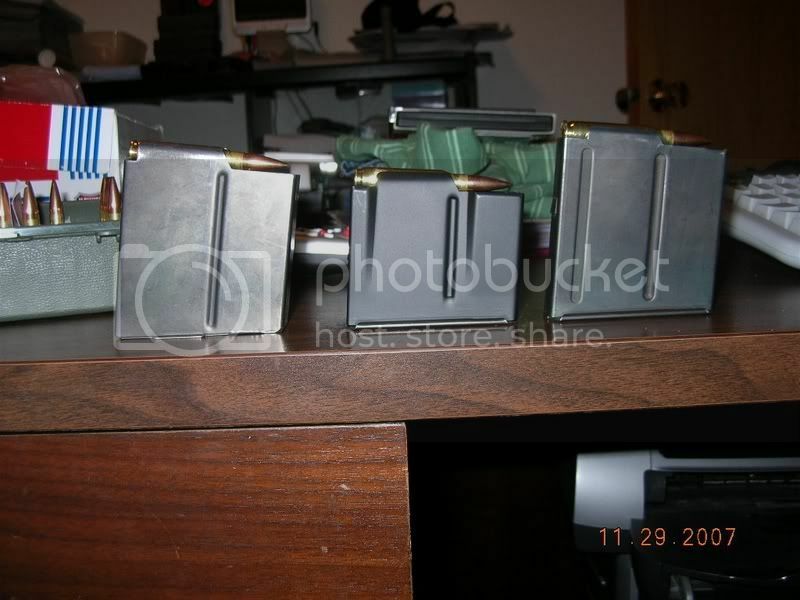 These are the .308 mags. The AE and AICS mags are 5 rounders to be fair and the AW mag is the only one offered, a 10 rounder. Some around the world shots to show the diffrence in length and width. Remeber, the AICS and AE mags hold 5, the AW is 10. Also note, the AW mag is the only one welded. VERY WELL DONE Rolex! Thanks for the info and pics, it is nice to be able to actually SEE the differences. They all are welded just not the bottom plate. I have been bumbling along thinking Accuracy International and Badger DBM's were the same. Which the Badger DM uses AICS Magazines, Badger makes the bottom metal, Accuracy International makes the magazines. Also , both the AW 308 & the AICS 308 , actually appear to have the same external size . as the AW mag fits in my AICS stock . I had thought of tiring to get a Surgeon SA to run AW mags at one stage , not sure it would work out ? 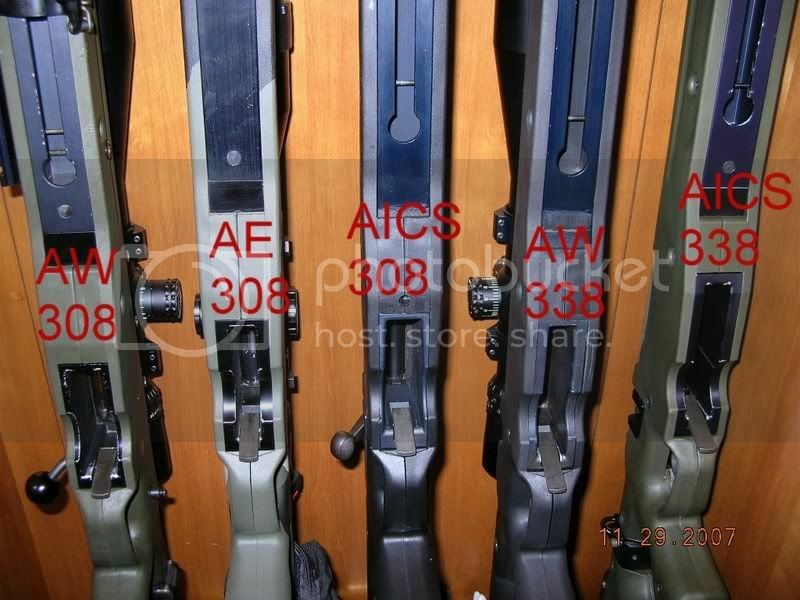 Do rifles set up for the AICS feed reliably from AW mags? Hey guys I am going nuts here... I saw a post the other day where someone modified a mag so they were fitting flush in the magwell... but now I can't seem to be able to find that... can anyone send me a like to that post or if they know who it was that did that, let me know... I think he was using AICS mags, but I don't recall. so my 10 rounder AICS mag is really an AW? It sure doesn't look like one. dont you have weekends off biznatch? Just reading through this - does anyone know for sure if the AW 308 magazine will fit in the AICS magwell and feed reliably? 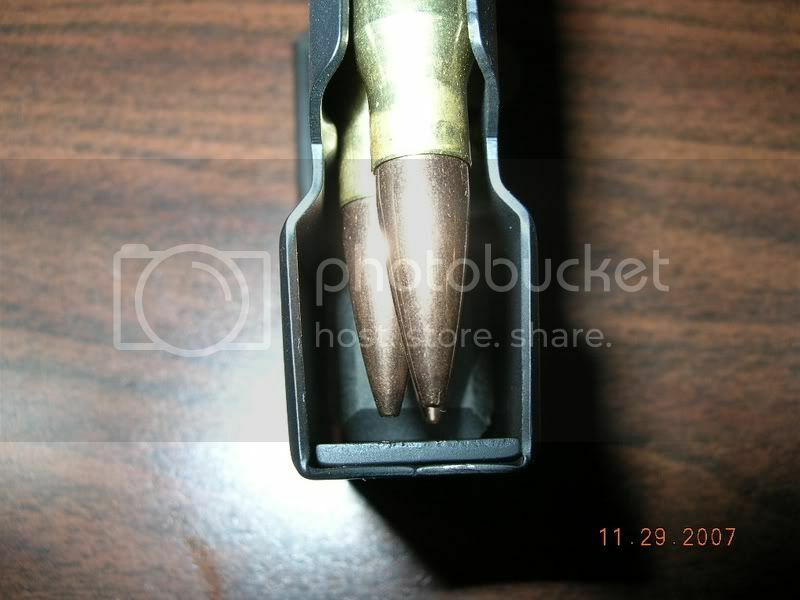 I know the width and height are close but is the latch feature the same height from the top of the mag the same on both? 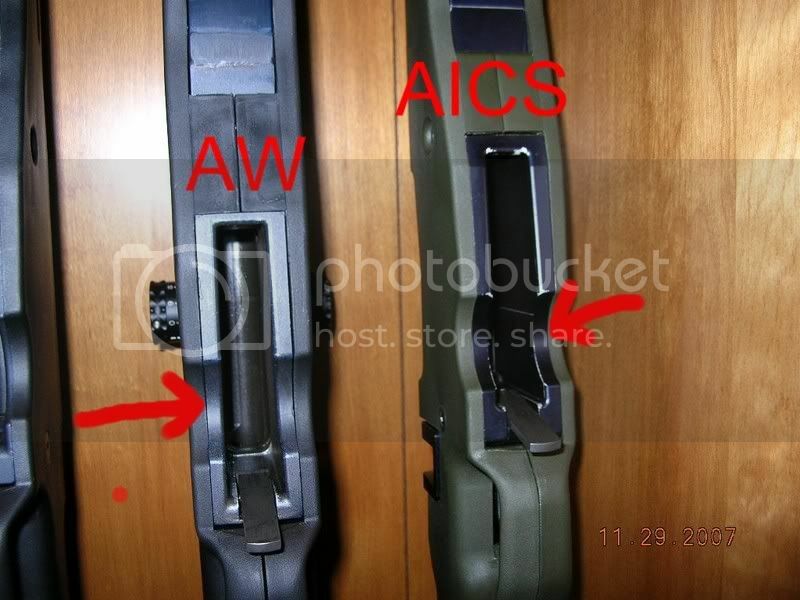 If so, I'll be looking to purchase a few AW mags for use in my AICS. your forgetting one is set up for center feeding from a single position he other is staggered from two positions. Even though the overall size is similar the feed lips and feeding set ups are worlds apart. Thanks for the review, but Im confused as to the advantages and disadvantages of each. For a .308 which is best? Depends entirely on what you have or are getting. I personally like the 10 round AW setup the best as the mag is no longer than the 5 round AE mag. But I you are building a Remington based build you don't have that option... Personal preference is what it comes down to. Im building a .308 with a Surgeon action. Since that is more or less a "Remington based build" I guess the AW is out? What would it work with? AICS mags are your only option. The AW and AE are stand alone rifles, your only choice in a custom build is an AICS. another ignorant question but has anyone tried to modify an AE to use AW mags? Looks to me like there is plenty of machining room in that AE magwell. I am sure there is more than meets the eye or someone on this site would have done this by now. Not impossible, but I would suspect there would be a bit of welding and machining just to the receiver and I would never do that to mine... Somebody posted pictures of the different feed ramps a while back and it was deemed too much of a headache for 5 extra rounds. Bump to the top for the newbs. Will be getting my action machined next week to feed from AW 10rd mags. Action is a rem 700 SPS with a BO M5 fitted, will have the feed ramp scallopped wider to allow for the stagger feed and the feed rails in the action machine out to allow for the mag lips to fit. Il post pics when it's done. Really appreciate the good info, you've answered some questions I was pondering over. It seems to me that double-feed AW mag would be easier to load as well. Can either be made to tun in a TRG? In comparing AICS and AE mags in a McRee build stock with rem ltr barreled action .308 both will work but Scott mentioned AE mags have inconsistances and he checks each AE mag before selling. There appears to be more room for length in the AE. 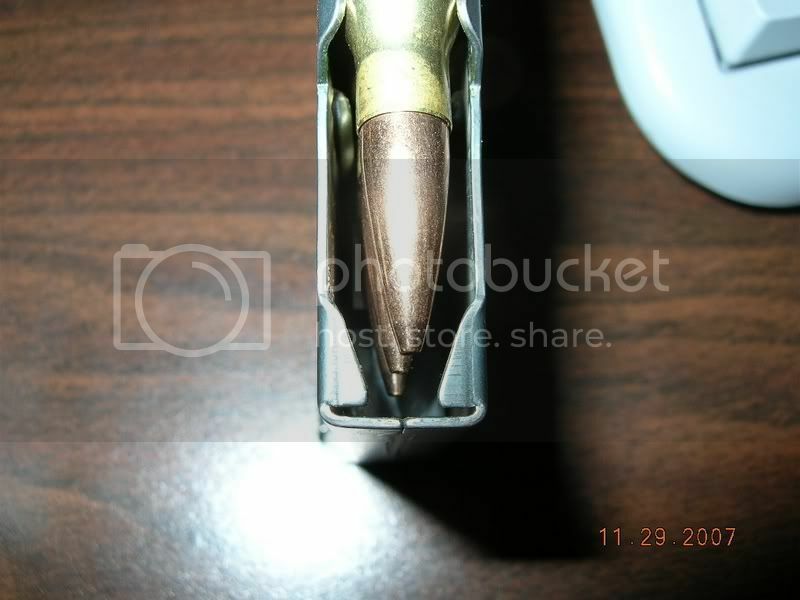 What bullet do you have in there, and how long could you have loaded it if you wanted to? 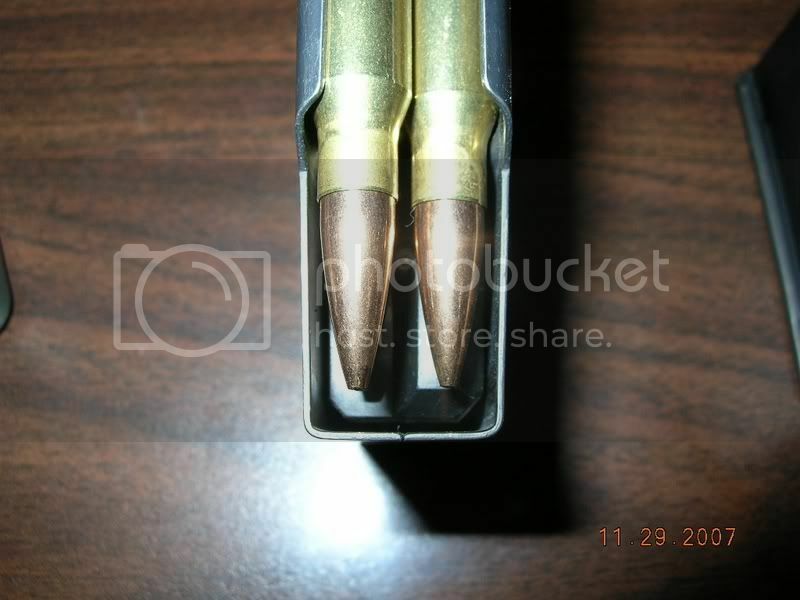 What is the longest OAL for a .308 round that will fit into an AICS magazine? The jobs done, and well worth the wait. Ill throw some pics of it and my stick later tonight. Very helpful post. Thanks much! 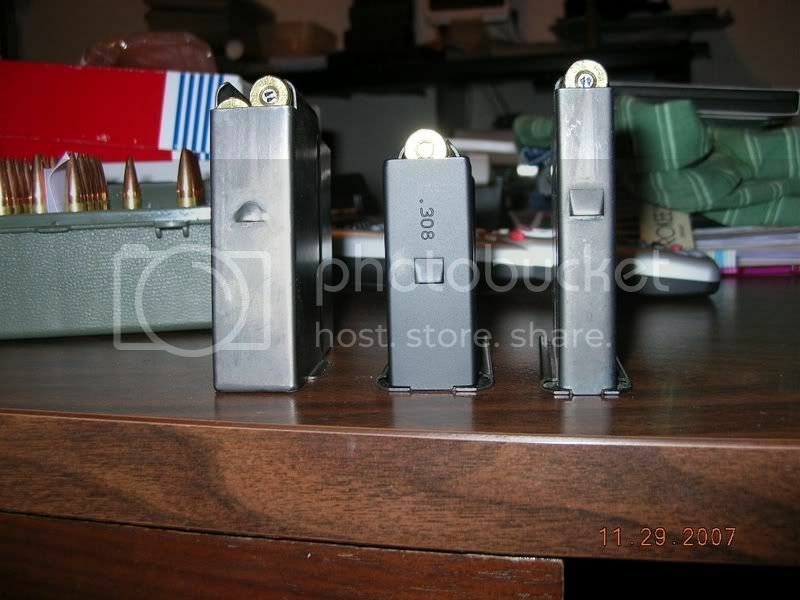 Ok here are some pics of my SPS Tac 308 action after i had it milled by my local smith IOT fit AI AW 10rd mags. The DBM is a BO M5. The feed rails were milled down to allow the mag lips to up inside the action, and the feed ramp was widened IOT allow ease of feeding from the double stack mag. Some minor widening was required around forward corners of the mag well/box. This allows me to use both AICS mags and also the AW mags, which i prefered due to its lower profile when fitted, compared to the AICS 10rd. Thanks go to Glen seekins and George at GAP for there advice and guidance, and a big thanks to my local smith Charlie for his dedication and hard work on this rifle. 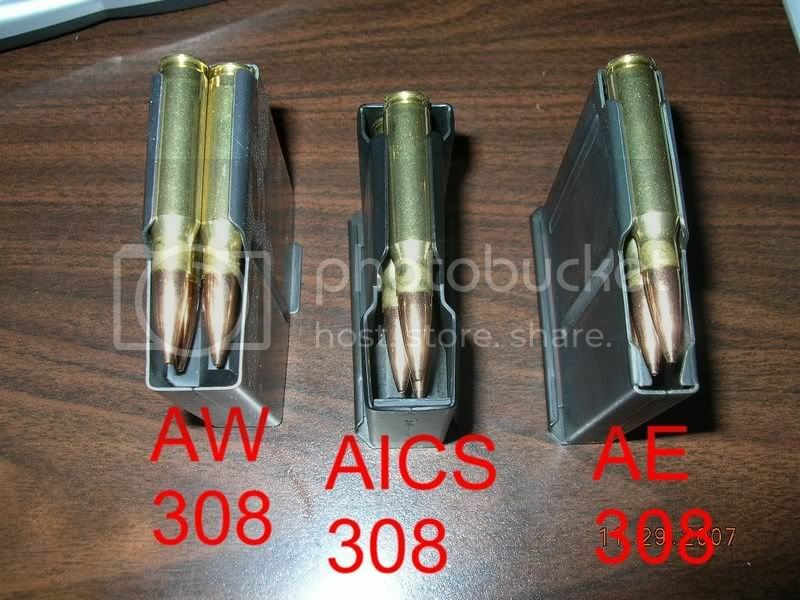 Since this is supposed to be the "AW/AE/AICS mag difference" thread, it would be good to know if there are any differences in cartridge OAL possibilities between the three magazines. Reloaders using certain types of bullets would be interested in knowing which mag system better fit their desired bullets. I would do it for you if I had all three mags, but I don't. Can the AE be retro fitted to accept the AICS. Seems they both taper to approx. the same size. <div class="ubbcode-block"><div class="ubbcode-header">Originally Posted By: LongTines</div><div class="ubbcode-body">Excellent job! I am really confused by some of the post here. The AW and AE are factory built rifle systems based on a specific criteria for each. Are you saying you would base you rifle purchase solely on the length bullet you can load despite the significant price difference of each. 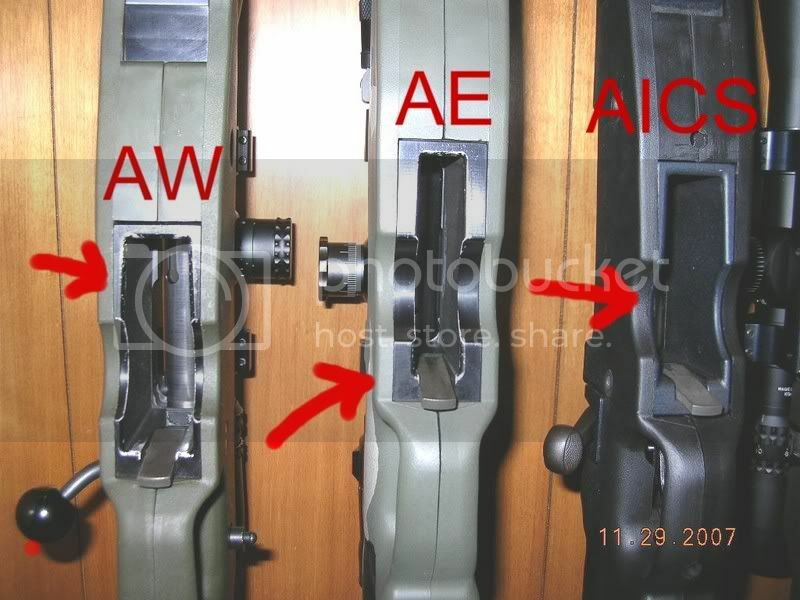 You are looking at a $2500+ Rem style AICS gun vs. a $3500+ AE vs. a $5500+ AW as if they are all identical options. What I am missing in your logic here?